CLICK THE PLAY BUTTON IN THE CENTRE OF THE IMAGE BELOW TO HEAR THE SONG! Available from this website or iTunes in either the “Zed” or “Zee” version. The audio version of our video is wonderful for encouraging imagination, listening skills, following cues, co-ordination, participation and lots more! 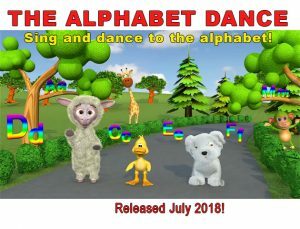 If you’d like to see the FABULOUS ACCOMPANYING VIDEO which also has the song, and shows the children characters showing kids how to do the actions, follow this link THE ALPHABET DANCE! Do the alphabet dance using these actions that go with the letters – engaging and fun action song! A great learning song to learn the alphabet – forwards and backwards just for fun!! It’s especially good if adults dance it with the children too! Just one of many original and traditional nursery rhyme songs and videos for children. “Come do the alphabet dance with me. We’re going to say the ABC. Listen for the clues and do the actions too. The alphabet dance can be done by you. A – arms up high, B bend down low, C clap your hands, D dancing slow! E elbows touch each other, F fingers wriggle too, G giggle a little bit then touch your shoe! H hop on one leg, I Incy Wincy plays, J jump up high, K knees bend today. L lean to the left, M mouths smile and kiss, Nose and fingers together…no! Give this a miss! O can you make that shape with your arms, P put your hands together using your palms, Q is for quiet, say “sh” right now, R roll your hands and take a little bow. S stamp your feet, T turn around, U up you stretch then touch the ground, V make a V shape with your hands, W wave your arms like waving fans. X can be done with your arms in front of you, Y yell “there” and point to something blue, Z for zoo ends the alphabet for you… We’ve done the letters and a little dance too! A B C D E F G H I J K L M N O P Q R S T U V W X Y Z. Can you say it slow…NO! OK we’ll say it backwards, here we go! Z Y X W V U T S R Q P O N M L K J I H G F E D C B A.